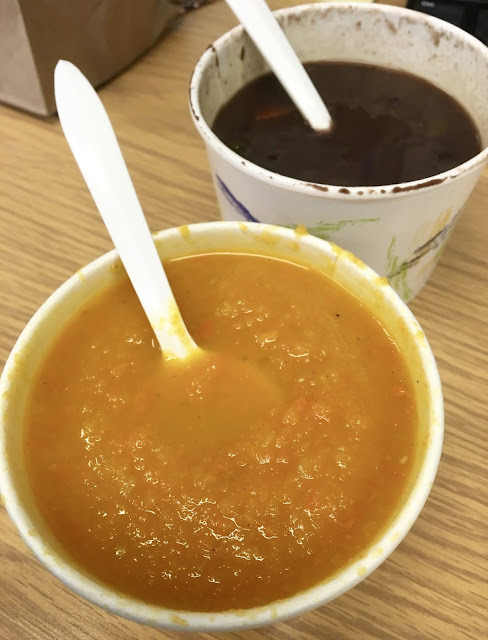 The day I visited, the two vegan soup options were both gluten-free: a Yucatan black bean soup and carrot ginger. Indecisive about which to try, I bought a cup of each to try. In the bag of both soups, I was provided packets of sea salt to season the soups accordingly. The black bean soup was hearty and packed plant-based protein. It was thinner than the Cuban black bean soups I am used to, but I liked the thick, flavorful broth. I sorely wished I had a slice of gluten-free sourdough to enjoy with the soup, and definitely will plan ahead on my next Soup's On visit. The carrot ginger soup was the showstopper between the two. Pureed and thick, the soup was velvety flavorful, with the sweetness of the carrot and the distinct ginger flavor shining through in perfect proportion. I added a bit of sea salt to this soup, which only enhanced the flavor, adding just a tad bit of saltiness to balance the sweetness. I relished every spoonful, and dreamt about the soup for the rest of the afternoon. I definitely look forward to frequenting Soup's On as summer gives way to fall and winter. I might "forget" to pack lunch more often as an excuse to check out what seasonal delicacies are gracing the menu board. The soups were outstanding, but the service too is worth noting, as the owner was really knowledgable about ingredients and willing to go above and beyond to assist me with my order. Special Feature: Check the daily soup options online here.